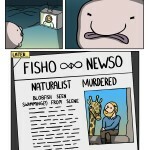 Yep, the blobfish. Maybe you remember seeing it all over the internet years ago? We forget about the world’s monstrosities too easily I think, so consider this a reminder to be confused more often.